Boating can be a social sport and many enjoy boating with family and friends. However, occasionally you might find you have to move a boat on your own. Whether it is at the beginning or end of the season, or an effort to locate a better cruise in the near future, you may be faced with single-handing our boat. 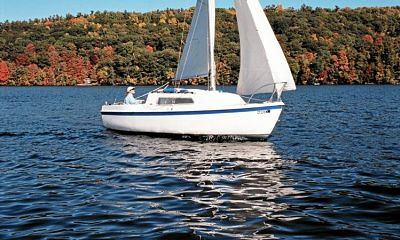 Whether the trip is to be of short duration or several days in length, boating single-handed presents several challenges. Fortunately, with good planning for both yourself and your boat, and an eye on the weather, these challenges can be overcome. Here are the elements you should prepare before heading out on an inland or near-shore trip of relatively short duration. While these items also pertain to offshore planning, this article discusses boating trips within a reasonable distance of shore. Taking to the water in a boat that is not in tip-top seaworthy condition is foolhardy at any time, and even against the law in many places. If you are planning to single-hand the boat, it is critical that everything be in good shape. The battery that does not take a full charge; the anchor light that does not work all the time; the small leak that causes the bilge pump to come on more often than it should — all of these things need to be remedied before heading out alone. Engines should be well tuned, sails should be in good condition, and everything that makes the boat a safe platform to support you should be inspected. Deficiencies must be repaired. If you are in a powerboat, ensure you have enough fuel and you plan stops to refill preferably before you reach the last third of your tank. Likewise, every other aspect of the boat must be in good shape. The chafed line, the galley pump that needs a new diaphragm, the hatch with the broken latch, anything and everything that does not work properly or is showing signs of wear should be replaced. Little irritants can turn into large problems in an emergency. If something unforeseen happens such as bad weather, you want to be able to concentrate on navigation and boat handling, not be bothered by something that might be leading to other problems. Single-handing means that you will have to prepare your own meals and clean up after yourself. While it sounds simple, if you are caught in a bad situation you do not want dishes and utensils flying about. Rather than the three meals a day you are used to onshore, you should pre-plan and pre-package food and drinks so that you are snacking throughout the day to keep up your energy level. If an emergency occurs, you will not be concerned with or slowed down by the need for food or water. Pre-packaging sandwiches, drinks in tetra-packs, and snacks allow you to eat without creating a lot of mess that you have to clean up. Food should be stored in something that can be quickly taken with you if you have to abandon ship. Many boaters keep changes of clothes onboard along with wet gear. If you do not, you should ensure that you have both warmer and cooler clothes readily available and easily accessible. Cold fronts can blow in quickly bringing sudden drops in temperature as well as blinding rain. There should also be extra clothes in your abandon ship kit. Safety gear required by law onboard a boat is a minimum requirement. As you prepare for a single-handed journey, remember that word “minimum.” In the real world of emergencies, the minimum requirement is never enough. In his book Adrift – Seventy-Six Days Lost at Sea, Steven Callahan describes the hopelessness of using the last of his limited flares within yards of another vessel that did not see him. While his situation was offshore and in a life-raft, this is a typical story that is repeated on the water in various ways every year. It is important to think about where your journey will take you and what items will provide the best chance of survival and recovery if that becomes necessary. There are different kinds of emergency signaling devices and some work better than others depending on the time of day. A VHF radio is a must. Cell phones can be useful within range of towers. Single sideband can also work well. But remember, all of these rely on battery power. Do you carry spares or have a way to recharge them? Of the three, a VHF radio is the best because search and rescue aircraft can hone in on a VHF signal but they cannot do the same with a cell phone. Likewise, it is important to review every piece of safety gear onboard from the bilge pump to your anchors and rode, and think about how they will work where you are going and how accessible they are in any emergency. Your charts should be up-to-date and you should have at least rudimentary navigational skills. A GPS is a convenient supplement but it too relies on electricity, and a drowned and shorted battery will leave you blind. Before you leave you should mark on the charts places where you can stop in an emergency and where you can stop for supplies if you anticipate needing them. It should go without saying that your personal floatation device should be worn at all times if you are single-handing. Struggling with a pitching and yawing boat is not the time to go looking for it. If at all possible, having a portable VHF attached to the personal floatation device or in a pocket can help if you end up overboard. A single-hander, especially offshore, should always wear an Emergency Position Indicating Radio Beacon or EPIRB. If you are going to find yourself on deck or in an open cockpit, you should have jacklines strung around the boat and you should stay clipped to them. While they are more common on sailboats, power boaters who may have to move to the front of the boat to deploy an anchor or a sea anchor should also rig jacklines or have some other way to attach themselves to solid anchor points on their boat. It can also be useful to run a line off the stern of the boat in case you take a tumble overboard while the boat is underway. It should be long enough, perhaps with a life ring or a fender tied to the end of it, that you can reasonably be expected to swim to it before the boat gets away from you. Years ago, being a boater usually also meant knowing how to repair almost everything on board. As boats have become more complex and lives have become busier, this is no longer always the case. However, if you are single-handing, it is a good idea for you to understand the mechanics of your boat and its equipment and to be able to make small repairs as needed. This might involve a small collection of manuals and a small collection of tools and repair items such as wire, tape, and moisture displacing spray, but this information and the required supplies are worth having. You should also have spare parts available for the smaller repairs you may need to undertake. Again, it is important to think about what could happen and how much you can reasonably undertake without calling for emergency assistance. A hole in your boat is among the most frightening occurrences on the water. A relatively small hole can let in an amazingly large amount of water in an equally amazing short period of time. Emergency procedures demand that you find and plug the hole before you begin to bail because one small bilge pump and one frantic person cannot keep up to a leak. You should be familiar with methods available to plug, or slow, leaks. Known as a “ditch bag,” the bags are for worst-case scenarios in which you have to abandon ship. You need to have one packed and easily accessible at all times. At the minimum it should include emergency signaling devices, food, water, clothes, and flotation. Other items will depend where you are traveling to, so look at your route and think about how long you might be on your own waiting for a rescue. Add more items as you see fit for every possible situation. A dinghy, either hard or inflatable, or a life raft is a convenient place to stow your ditch bag. It too must be easily accessible and easily launched by one person on a moving boat. On any journey that will last more than a day, you should have planned rest breaks. Motion, noise, and fresh air can be more tiring than being on shore. As well as being properly fed and hydrated, it is important that you are rested. These will also give you a chance to acquire any needed supplies or make any small repairs. Make sure that the float plan is as complete as possible and that you can contact the person holding the float plan if there are any changes to your status. It is also a good idea to check in regularly with the person holding the float plan to advise them of your progress. There have been many marine disasters because skippers tried to “get ahead of the weather.” Pick your travel time carefully to avoid as much inclement weather as possible. If the journey is a long one, it may be impossible to avoid some bad weather. Make sure you have places to stop along the way and that everything in the boat is properly stowed or tied down if bad weather is approaching. Ensure someone knows where you are and when you expect to report in again. Finally, make sure that your emergency gear is ready and you are ready to use it. Single-handing your boat is not a difficult journey to undertake as long as you prepare both yourself and your boat in advance. Short duration trips will not need as much planning as trips of longer duration. Common sense and safety should be your guides.